Flow Bar Kits ...... Just Add Glass!! Looking for a simple way to make interesting fused pattern bars? 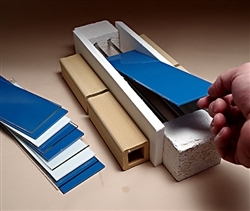 With the Flow Bar Kit it is easy to make your own intricate Flow Bars. Just coat the interior with kiln wash, stack some strips of glass on the stainless steel rods and fire in the kiln. 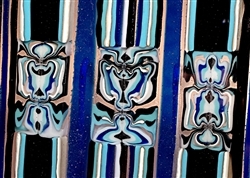 As the glass softens and flows over the rods into the container below, the pattern swirls and moves creating unique designs that can be consistent throughout the length of the finished glass bar. The results are beautiful and breathtaking glass pattern bars that can be sliced on a diamond saw to reveal their inner design. 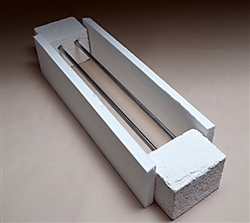 The kit includes 2 - pre-drilled fire brick end pieces 2 7/8" wide , 2 - stainless steel rods, 2 - fiberboard walls, instructions and firing schedules. This kit is perfect for smaller kilns. The rods and walls are 12" long so the minimum kiln shelf size needed is 6" x 13". It will also work on a 13" round shelf. The fiber board sides need to be supported or they will fall over during firing. Placing two kiln posts at least 5" x 1 5/8" x 1 5/8" on each side to hold up the walls will keep them in place.